Since its founding in 1987, the Pacific Institute has worked to understand the links between water resources, environmental issues, and international security and conflict. This has included early analytical assessments (such as a 1987 Ambio paper and this one from the journal Climatic Change) of the risks between climate change and security through changes in access to Arctic resources, food production, and water resources, as well as the ongoing Water Conflict Chronology – an on-line database, mapping system, and timeline of all known water-related conflicts. In 2014, an analysis of the links between drought, climate change, water resources, and the conflict in Syria was published in the American Meteorological Society journal Weather, Climate, and Society. The Chronology includes incidences of violence over water resources going back 5,000 years to myths, legends, and recorded history in ancient Sumeria and Mesopotamia. This week, the Institute released the 2015 update, bringing the number of recorded conflicts to nearly 370, from every populated region of the world. The full list can be found here. Eleven new examples from 2015 have been added, along with some from previous years that other researchers and readers have brought to our attention. The Chronology includes conflicts over access and control of water resources, attacks on water infrastructure during wars and regional violence, the use of water as a weapon, and terrorist attacks where water systems or users were explicitly targeted. In 2015, the key locus of conflicts was, perhaps unsurprisingly, the current Middle East, where years of civil war, ethnic and religious violence, and ideological conflicts have taken a harsh toll. Among the countries with entries in 2015 are Yemen, Iraq, Iran, Syria, and Afghanistan, including cases involving the Tigris and Euphrates Rivers in exactly the same region of Mesopotamia as entries from 2500 BC. Examples involving Russia, the Ukraine, Somalia, and Colombia were also added in 2015, along with some new earlier instances, including a new entry for 1904 from the brutal suppression of the Herero people of German South-West Africa (modern-day Namibia). Among the most disturbing trends in 2015 was the intentional and unintentional targeting of water infrastructure in several of the ongoing conflicts in the Middle East and the Ukraine, attacks on water pipelines and water supply systems in Syria and Iraq, and the use of major dams as weapons of war in Iraq. In other parts of the world, however, we also saw several instances of violence over access to water, from low-level fights among land owners to the deaths of thousands in Yemen in armed fights over wells and other water access points. Over the past century there has been an increase in the number of reported conflicts over water resources (Figure 1). Part of this increase is certainly due to better reporting in recent years, but growing populations, rising demands for water in water-scarce regions, and weak governance structures and institutions for reducing conflicts at the local and regional level may also be contributing to an increase. In the coming years, far more effort is need to both understand the nature of these risks and to develop diplomatic, economic, and institutional tools for reducing conflicts over water resources. The Pacific Institute will continue to be the leading source for collecting and analyzing information on these challenges. Figure 1. 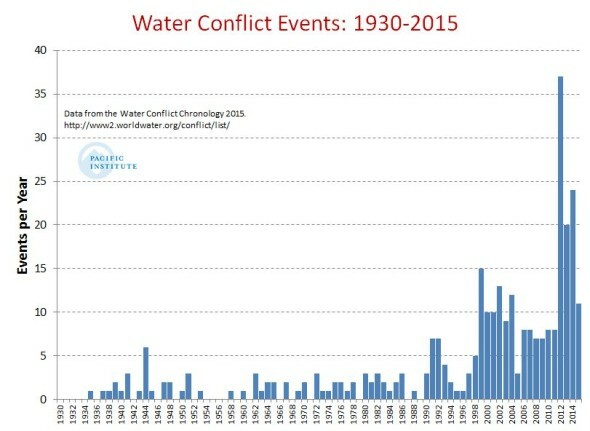 Water conflict chronology events per year, 1930 to 2015. From the Pacific Institute.